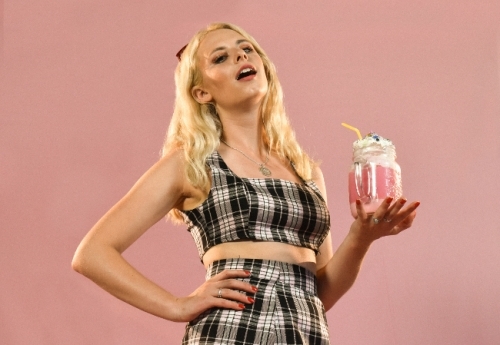 With a distinctly British sound and swagger, Drink 2 U is the latest single from London based singer-songwriter Kate Lomas. Co-produced and written with longterm collaborator Guy Britton, the track is currently BBC Introducing’s Track of the Week on Radio 1, having already caught the ear of Spotify upon release with inclusions on New Pop Revolution and New Music Friday (DE, FR & CH) editorial playlists. Released on her own label, this anthemic and beat heavy dose of electro-pop blends the best of Lily Allen and Lorde into a gloriously addictive and compelling pop anthem. Her previous single, Sweet Strange Days spent the summer floating through airwaves in H&M stores worldwide after being championed by Indie Shuffle, High Clouds and Born Music. Talented, ambitious and with her own distinct sound, Kate Lomas is an artist on the rise and we can't wait to hear what's next. One to watch.